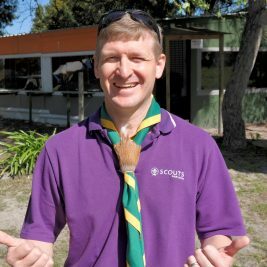 The rules governing the annual HV Marsh Award for Scout Journalism have been amended to accommodate the submission of digital newsletters and blogs on Group websites. In the past, most Scout Groups submitted expensive, commercially printed, full colour copies of their newsletters. The judges of the annual competition recently noted a significant drop in printed entries due, they believe, to the high cost of producing full colour printed newsletters on expensive paper. As has been experienced in mainstream journalism, the actual printed word is rapidly taking second place to the growing on-line distribution of news. This trend is already evident from the number of Scout Groups who are already disseminating their news using digital newsletters or blogs / articles on their websites. What is the HV Marsh Award? Founded in 1963, the prestigious HV Marsh Award attracts entries from Groups throughout the country. The basic philosophy behind the Award remains the encouragement of journalism and the promotion of effective communication within the Scouting community. Besides the main trophy – a magnificent Kudu Horn carrying the names of the previous winners – runners up qualify for Gold or Silver certificates. The judging criteria of the individual entries will remain the same, taking into account: the variety of the content; the value of the information contained therein; the layout of the digital newsletter or page design of the blog post / online article and the actual personal involvement of Scouting members (Patrol/Six reports etc.). Most important: Groups wishing to enter the next annual competition must advise the National Office of their intention to do so by completing this entry form and submit it to info@scouts.org.za by 28 February. Actual judging of the website and blogs will be based on the contents displayed on the four quarterly dates: 31 March, 30 June, 30 September and 15 December. Do not forget to retain printed A4 screenshots of each quarter for submission of such material to be sent to the national office by 31 January annually. The judges reserve the right to look at individual websites during the course of the year. Judging will be based on the content of the websites and blogs on the four dates and must be submitted to the National Office by 31 January the following year via info@scouts.org.za.